This fern was shipped quickly and came neatly packaged. It is thriving and doing well and it has already been several months. Received in excellent and healthy condition! Plant sat on countertop in kitchen for a couple of days while I decided on pot to put it in. Repotted then placed it in it's new home and it's been very happy ever since. Very impressed with order and company. This plant was purchased to go around an outbuilding and it looks amazing! Wood Fern is native to the cold, temperate areas of North America, Europe, and Asia, and can be found primarily as a groundcover in alpine forests or growing beneath the canopy of clustered evergreens. The fronds of the Wood Fern are particularly large and lacy, very wide, which helps provide a dramatic, feel to any landscape or garden. The center stalks of the fronds are thick and woody, and this fern is far more likely to stay green through harder winters than many other fern varieties. This fern is considered the most desirable evergreen plant as an ornamental element for garden borders, rock beds, and landscapes. 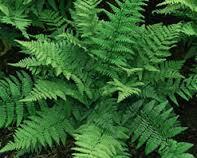 These are very hardy and durable ferns because of the weather conditions that they can withstand. Homeowners love them because they are easy to grow and maintain. Wood Fern look great when used around fences and other locations to create a fantastic and beautiful border. These are great to bring in lots of color and life to a garden or other natural area. These ferns are always shipped from this beautiful online plant nursery and are received and ready to be planted in an unusual location.The fronds of the Wood Fern grow in circular clusters. Its leaves are green and play an important role in acting as a storage organ for nutrients. The plant thrives well in wetlands and terrestrial areas. The plant’s leaf blade can divide three or two times. They grow up to 25 to 50 centimeters long. Scales and hairs are present on the Wood Fern’s stalk. Leaf veins on the plant ended in small and round expanded areas, and they do not reach the edge of the leaf blade. The plant also reproduces using rhizomes which can grow on or below the soil. It is a sporophyte. However, it's sterile and productive fronds do not differ. Wood Ferns have the same shape and size.